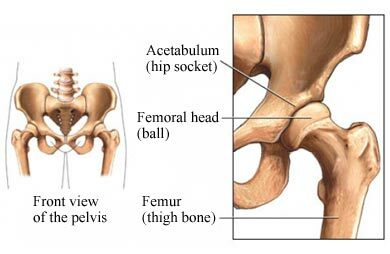 Aseptic necrosis of the hip is the death of bone tissue in the head of the femur (thigh bone) due to poor blood supply. There is a certain type of aseptic necrosis of the hip called Legg-Calvé-Perthes disease. It affects the growth plate at the upper end of the femur in children. It is most common in boys aged 5-10 years old. Aseptic necrosis of the hip is caused by any event or condition that damages the arteries that feed the head of the femur. The most common events are fractures in the upper femur and dislocations of the hip, especially developmental dysplasia of the hip. Other causes reduce the blood supply by closing off or compressing the blood vessels. Your doctor or physical therapist may advise non-weight-bearing exercises to slow disease progression. There are several surgical surgeries used to treat aseptic necrosis of the hip. The choice depends on the extent of disease and the age and health status of the patient. Bone grafts, decompression of the inside of the bone, realignment of the bone, femoral head resurfacing, and prosthetic hip replacement are some options. Osteonecrosis of the hip in adults. EBSCO DynaMed Plus website. Available at: https://www.dynamed.com/topics/dmp~AN~T114907/Osteonecrosis-of-the-hip-in-adults . Updated December 6, 2017. Accessed February 8, 2018.